We love to read mythology fictions. Actually, since last few year, there is a rise of books in this genre. And, it made some of the authors literary superstars! Actually mythology itself has (at least a part of) fiction associated with it. And, some authors try to setup the stories in the modern backdrop. While Ashwin Sanghi loves to follow Dan Brown path, Amish Tripathi retells the old story in new setup. Authors like Dr. Vineet Aggarwal and Col. Mohan Vizhakat keeps the ancient time frame as is. Amongst all these popular authors, a name was added a few years ago; Christopher C. Doyle. Grew up in India by reading and hearing mythological tales, he was attracted to this genre since long. His books on Mahabharata backdrop acquired the fame. 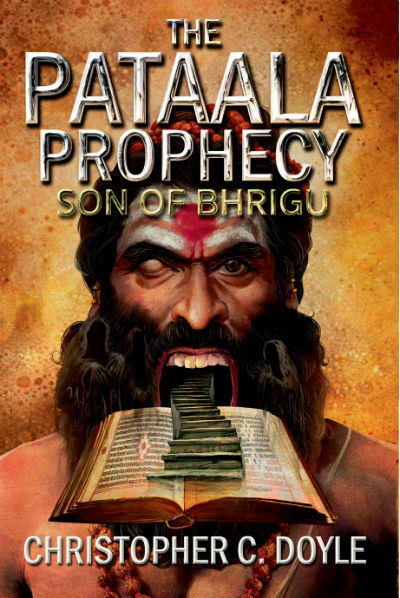 Recently, he came up with a new book named Son of Bhrigu (The Pataala Prophecy Book 1). As the name suggests, this book is going to initiate a new series. At the time of book launching, there were various promotional schemes going on. We, however, found it quite costly, and decided to wait for the right time to purchase it. And, there came a fantastic book deal on Amazon India, where the book was available for Rs. 69 (Kindle edition). And, we bought it 🙂 . By the way, you would like to follow us on various social networks and join our newsletter, if you want to get notified for such interesting promotions. The cover page of the book is quite interesting. For those, who don’t know, Shukra aka Shukracharya, the Guru of the Daityas and Asuras was the son of sage Bhrigu. And the book is referring him in the title. So you can see an illustration of a mighty yet cunning sage on the book. As it refers to a prophecy also, you can also see a scripture as well. Overall, the cover page tries to reflect the essence of the book title. The realistic illustration makes the face of Shukracharya quite realistic. Overall, we can give distinction marks for this cover page 🙂 . Let us take a bird’s eye view of the story explored in this fictional book. It all starts with a prologue setup in Egypt. And when you refer Egypt, Pyramids cannot be avoided right?! The prologue is something which has no direct connection to the story explored in this part. The main plot starts at a school in Delhi. A scholar from Allahabad University named Dhananjay Trivedi was doing the job of a history teacher in this school! It is rare to find scholars who performed remarkably well in their studies doing the job of a teacher in primary school. Teaching is his passion. Actually, teaching is an art. It is not all about mugging up the stuff from the book (or from other resources) and vomit it in front of the class. He mastered the art of teaching. He was a history teacher and he made his subject so interesting that the students started being his fan. He was fondly called as DJ Sir by some of them. One day, a person who identified himself as Vishwaraj seek for an audience with him at his home. Later, Dhanajay was found dead under the mysterious circumstance. It is kind of exception in the field of medicines where someone was found dead in such a strange way. His absence from the school made a many of the students heart-broken. His replacement teacher made the things even worst for some of them. Arjun Singh, is one such student. He and his childhood friend Maya were almost inseparable and shared a healthy companionship since they were infants. Actually Mrs. Pramila Singh (Arjun’s mother), Mr. Virendra Singh (Arjun’s uncle) and Mr. Naresh Upadhyay (Maya’s father) are all good friends and they shared same relationship with Late Dhanajay Trivedi also! Unfortunately, before years, Maya has lost her mother and Arjun has lost his father! Since then the group was living in a way that they can took care of each other. Superintendent of Delhi Police, Raman Kapoor was investigating the case of the murder of Dhananjay. Eventually, things started getting mysterious and along with the SP we also see many layers of the stories unfolding, making it even more mysterious! The story then moves from Delhi to Panna National Park, the Pandava Falls, the mysterious world of Gandharvas, the Gurukul ran by Sangha,… Well, it will be more interesting if you read it yourself rather we talk about it here 🙂 . The book is a fantastic thriller. If you are an avid reader and if you have explored so many popular books, then you can find many things in this book which can give you “deja-vu” feelings for sure. In fact, you can draw parallels with Harry Potter series while reading this book, both in incidents and dialogs! Christopher is good at vocabulary and his command over the language is visible throughout the book. He tried to keep the language as simple as possible, however there are some parts where it is necessary to use something exceptional. The author has done a large amount of research and read many reference books and other material. He acknowledges the same in the book as well. In fact, he mentions various incidents where he took liberty and portrayed in his own way! It was one of the reasons he loved school so much – the teachers made all the difference. It is very true. In fact, the entire track of how the replacement teacher (in place of Dhananjay) changes the perspective for many students. And, how a good teacher is different (and in what aspects) than an average teacher, who sees his/her work just as a paying job; is portrayed so well that despite it is just a small segment of the book, but I found it interesting. This was Delhi. the dust capital of the world. And, sadly, we have found that those who do not have the powers are almost always those who are not interested in making the effort to acquire them. Be it a political scenario or a social one, we see this being happened around us. Some people love the comfortable life and thus want to remain being a part of the crowd. Why bother? Well, the book tries to come up with an answer as well! It is better to serve humanity and fulfill our destinies by remaining unobserved and unknown. The author has explored the theory of Karma and fate without getting much of melodramatic. Sometimes (or rather we say, most of the times) simplicity is the key. It is our actions in this life that determine what we will achieve in this life itself. This is the law of Karma. Nothing in this world happens by chance. There is no such thing as luck. Only karma. You create your luck by your own actions, both in this life and your previous life. Don’t forget, predictions are accurate only at the time that they are made. Even they can change over time, depending on the actions of the people involved. That is the law of Karma. Your assumptions didn’t factor in the uncertainties of battle. There is no point in getting your technique right if you don’t have the strength and stamina to last out on the battlefield. Illusions. They could change things so dramatically. Alter evidence. Hide tracks. Distract the mind so that it would appear that magic had happened. These examples are evident enough for you to get an idea about the literary quality of the book, right? In addition, I like the strong characters of the book. The way the characters are emerged and then tentatively converted into something larger than the life is something you would love to explore. The author gave a perfect example of how a strong character can be built without worrying about the gender of the same. Actually, I cannot reveal more in order to avoid spoilers, but you can explore the journey of Maya to understand it better. So, the gender equality has nothing to with the character uttering abusive words or the length of the cloth she/he is wearing. Hope, some so called feminist authors try to understand it. The author tried not to make everything mythological and infused the reference of science where possible. Almost each character has its own shades making them more human. And, yes, there is no “adult-only” content in this book. The author is good at explaining nature, surroundings and battle, and it make the book interesting. The book is a good read for thriller and mythology lovers. Readers find parallels with many book series like “Harry Potter” book series by J. K. Rowling and some of the books by Dan Brown, but, that doesn’t mean that there is nothing unique there in the book. You may buy it during a promotion and you will surely enjoy it. Around 7.5 out of 10..